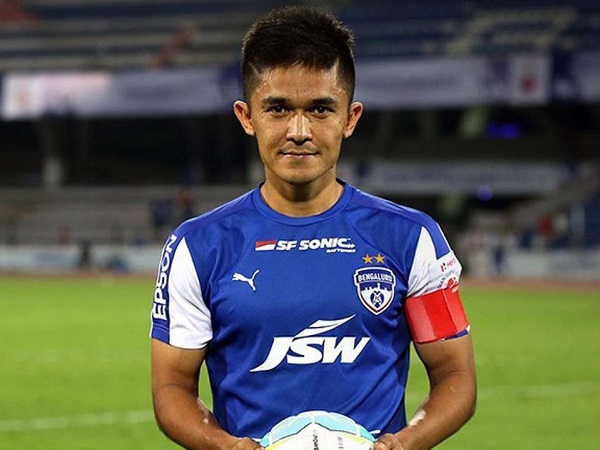 Sunil Chhetri, the captain of Indian football team, recently got shocked when a fan threw the tricolor on him with the intent of getting his autograph before the game. 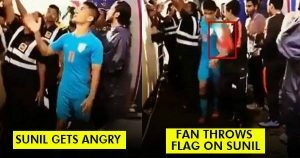 This unpleasant incident took place at Mumbai Football Arena during Intercontinental Cup that is going on presently. This act of the spectator naturally left Sunil disgusted and gave rise to an environment of uproar with the officials of AIFF, the captain himself and security guards. In fact, just after this, Chhetri made an appeal to the fan for not doing these kinds of activities which hurt the sentiments of people. In the tournament, lower-ranked countries like New Zealand (Rank 133), Kenya (Rank 111) and Chinese Taipei (Rank 121) are hosted by India. On Thursday, New Zealand won the match against India by 2-1 in Intercontinental Cup despite Chhetri scoring a goal in the 48thminute and giving India the lead in the match. Seven changes were made by the Indian coach Stephen Constantine from the last encounter against Kenya and it seems that the Indian team had to pay heavily due to these changes. In the first two minutes of the match, Sarpreet Singh (NZ) made three crosses which almost opened the defence of team India. The defeat of India by New Zealand has left the former short of final qualification and now India’s future will depend on the result of Kenya vs Chinese Taipei match. Presently, the Indian team is on the second spot in the points tally after Kiwis.